Originally from Mississippi, Jason Eady found his way to Texas in search of audiences that would embrace his original music. After a decade of splitting time between Fort Worth and Austin, Eady is now quintessentially Texan. 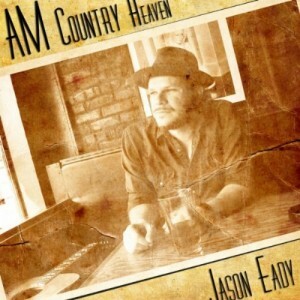 Eady has reached a creative pinnacle with his fourth release, AM Country Heaven. His singing voice tenors somewhere between Haggard and Willie, while his music evokes a time when country music was replete with honesty. He is a classic troubadour, and the experiences he’s had on the backroads of Texas spill into every aspect of this record. It was on those trips to gigs that this album was born. Late at night on the highways, often the only sounds to accompany someone is the soothing classic country sounds that emanate from the AM radio waves. The type made by ugly women and 40 year old guys living the songs they sang. The type that inspired Eady and the producer of this project, Kevin Welch, to create a modern musical loveletter to a bygone era of music that is sorely needed in today’s country marketplace. AM Country Heaven is full of unapologetic, authentic, throwback honky-tonk music. Despite the classic structures, the entire collection has a progressive contemporary vibe. This is not an album that sounds dated. It’s a fresh spin on a familiar genre. All the songs are written or co-written by Eady (with the exception of two outstanding Scott Copeland cuts) and his lyrics are full of fresh spins on classic country themes such as lying, cheating, drinking, nostalgia and redemption. The players are the absolute A-list of honky-tonk music: Redd Volkaert on guitar, Lloyd Maines on steel guitar and Earle Poole Ball on piano. The tunes they’ve created range from the whining steel of “Tomorrow Morning” to the sparse Red Headed Stranger-esque title track and the twangy Telecasters on “Old Guitar and Me”. Grammy winner Patty Loveless even pops up for a winning duet on the bluegrass tinged “Mountain of a Man” that was co-written with Drew Kennedy and Josh Grider (also appears on Grider’s Live at Billy Bob’salbum). Jason Eady has grown and evolved with each release. AM Country Heaven finds him morphing from roots revivalist to a revivalist of country roots. If like most Texas/Red Dirt music fans, you were too young to enjoy the prime of Haggard, Jones, and the Outlaw movement, Eady has given you a chance to experience real, honest country music firsthand. Easily, one of the finest albums that will be released in 2012 and sure to make waves that should be felt far beyond the Texas scene. What i do not understood is actually how you’re no longer really much more smartly-preferred than you may be right now. angles. Its like men and women are not interested except it’s one thing to do with Woman gaga! I’m gone to tell my little brother, that he should also pay avisit this blog on regular basis to get updated from most recent gossip. hi!,I like your writing very a lot! proportion we keep in touch more about your article on AOL? I just want to say I’m very new to blogging and site-building and seriously enjoyed this blog site. Very likely I’m want to bookmark your blog post . You really have outstanding writings. Regards for sharing with us your website page. Hello.This post was extremely fascinating, particularly because I was looking for thoughts on this topic last Sunday. I was just seeking this info for some time. After 6 hours of continuous Googleing, at last I got it in your site. I wonder what is the lack of Google strategy that don’t rank this type of informative websites in top of the list. Generally the top web sites are full of garbage. I have learn some good stuff here. Definitely price bookmarking for revisiting. I wonder how so much effort you put to make this type of excellent informative web site. You completed a few good points there. I did a search on the subject matter and found the majority of persons will have the same opinion with your blog.